The employees of BRAC Bank has organized a mini marathon titled "BRAC Bank DOUR 2017 – Kalyaner Pothochola" to raise funds for charity. This is the first such marathon initiative by a bank in the country. Mr. Annisul Huq, Mayor, Dhaka North City Corporation attended the program as the Chief Guest at the annual marathon at South Plaza area of Jatiya Sangsad Bhaban on January 6, 2017. Mr. Selim R.F. 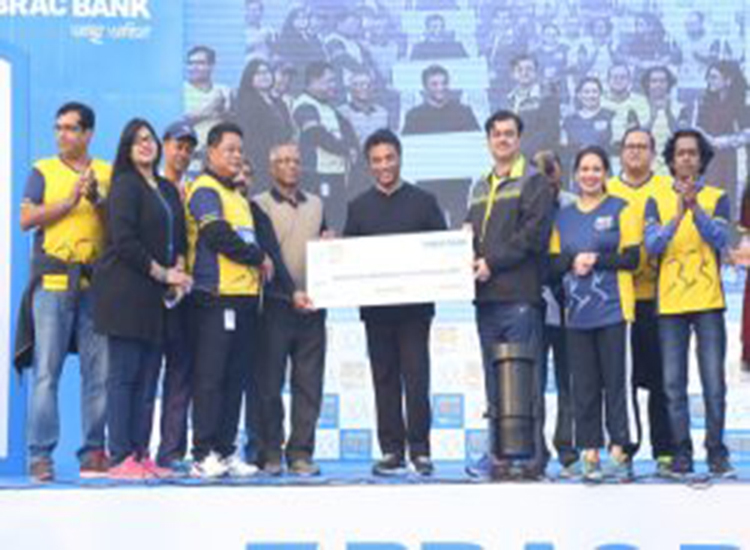 Hussain, Managing Director & CEO, BRAC Bank Limited and the employees of BRAC Bank across the country took part in the marathon for a social cause. The officials of other private banks, corporate houses and media and film celebrities also participated in the marathon. On the occasion, the employees raised funds which the company doubled and they donated Tk. 10 lac to the Centre for Rehabilitation of the Paralysed (CRP) which provides treatment and rehabilitation support to disabled people. After the marathon, Mr. Selim R.F. Hussain, Managing Director & CEO, BRAC Bank Limited, handed over the cheque to Md. Shafiq-ul Islam, Executive Director of CRP.